Store hours subject to change without notice. Please check back frequently for updates. For inquiries or buybacks, please email us. We're the largest independently owned and operated off-campus bookstore in Canada. 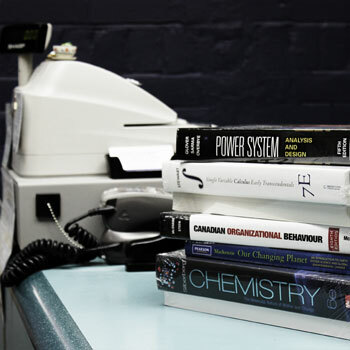 We sell course textbooks for George Brown - St. James, Ryerson University & U of T - St.George students. We sell the same titles and editions as your campus bookstore at cheaper prices all year-round. Each and every semester, we stock a large selection of new and used textbooks. Since we always sell the same titles and editions as your campus bookstore for less, take advantage of our Lower Price Guarantee. If you find an identical textbook at the campus bookstore priced for less than our discounted price, we'll offer an additional price reduction on all remaining stock. Conveniently located just a few steps away from your school, we extend our operating hours at the beginning of each term and maintain regular hours throughout the entire year to serve you better. We'll buy your textbooks if they're on course/in demand for the current term. Visa, MasterCard, Debit, and Cash accepted. Although the refund/exchange policy varies according to the school we serve, you can be sure that it's identical to the one posted at your school's bookstore. We are a green company. Our focus is to reduce, reuse, and recycle. We run an efficient operation with the future of the environment in mind by actively reducing the amount of documents printed; using double-sided paper; reusing and recycling our skids, cardboard boxes, packaging material, paper, & old edition textbooks. Buybacks begin on the first day of each semester. It's always best to sell your curriculum-specific textbooks during the first week in order to receive the highest value. If we're unable to buy your textbooks due to low demand or overstock, we may be able to offer a wholesale value. Email your list of textbooks for valuation. 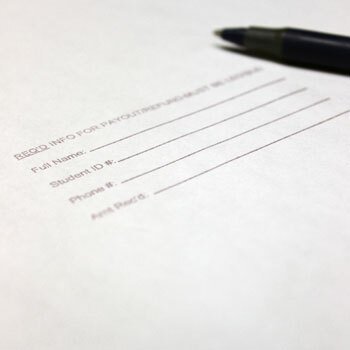 In your email, simply write down the author, title, & ISBN. We pay up to 50% cash for your textbooks. Amount payable is based on the publisher's retail price. For example, a textbook that originally costs $100.00 is worth $50 cash. Email us for a buyback quote. Write down the author, title, & ISBN. We'll let you know if we can buy your textbooks. Your student photo ID card is required for all cash payouts. We do not buy computer software, photocopied books, overstocked titles, or old editions unless they're still in demand/on course. You can save up to 70% by renting your course books. Rentals are available instore and coming soon online. I (the Renter) agree to return the book(s) rented by the return date or pay the balance and administration fee. Discount Textbooks has the right to refuse any rental return if the book is more than 1/3 highlighted, damaged, missing any of the original components such as CDs, etc. I (the Renter) am the legal holder of the credit card used to rent the book(s) and can authorize future payments. I (the Renter) give Discount Textbooks the authority to debit my credit card in the event that the rental book(s) is not returned by the return date in acceptable condition. It is the Renter's responsibility to select the correct book(s). Discount Textbooks will make an imprint of the Renter's credit card with security code and the imprint will be returned to the Renter when the rental(s) is returned by the due date. Discount Textbooks will charge a $20.00 administration fee, in addition to the balance owing, for each book not returned by the due date. 4.Submit form with the book(s) you wish to rent at the Rental Station located at the front cashier area. 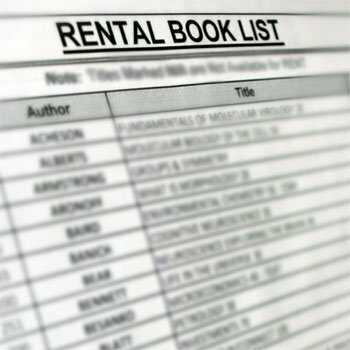 Only books listed on the Book Rental List are available for Rent. From the Victoria Building (VIC), 1 min. 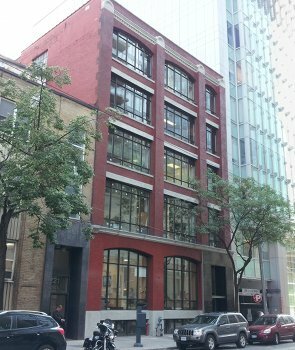 walk, cross Dundas St., continue south along Victoria St.
From the Ted Rogers School of Management Building (TRS), 3 min. 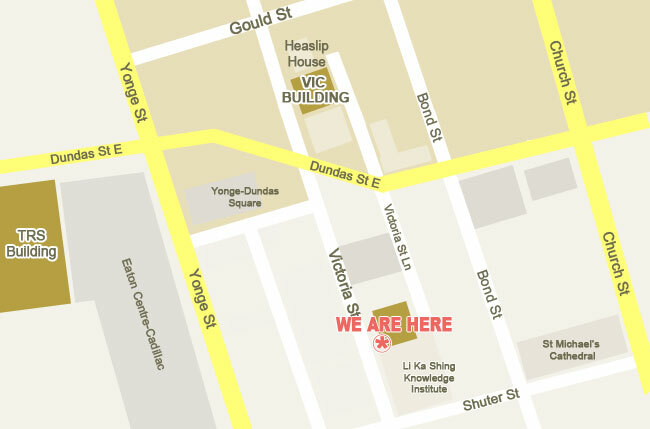 walk, go across Yonge-Dundas Square, turn right at Victoria St., continue south. Once you find our building, go up a short flight of stairs & walk to the end of the hallway. Exchanges are permitted within 5 days of your initial purchase date. Present your original sales receipt along with the textbook in original condition. Must be unused/unopened without handwriting, highlighting, or visible damage. You will receive store credit for all acceptable exchanges. Course material purchased during examination periods are final sale.